Brian Urlacher wasn't born with a silver spoon in his mouth by any means. When he was young, his parents divorced and his mother, Lavoyda, was forced to work three jobs in order to support the family. Later when she remarried, they were still living, according to Brian's best friend, Brandon, from "paycheck to paycheck." Whatever his life circumstances were when he was young, Brian learned to be a tough, hardworking football player. If he got slammed on the field he got up and was ready to roll again. He was never one to wear jewelry, dance around the field or trash-talk. When Brian was in high school, his determination was already evident. He wasn't a big guy. In fact he was only 5'9" tall and weighed in at 160 pounds. He worked and trained hard, bulked up to fighting weight and by the time he was a senior in 1995 he "was a scoring machine." All his hard work eventually paid off because he ended up being "one of the most popular Bears' players ever." In this book you'll see him in action, learn about his high school days at Lovington, his days on the University of New Mexico team, his "special position" there, how he was and is a total team player, how he became NFL Defensive Rookie of the year (2000), his "game," and much more. 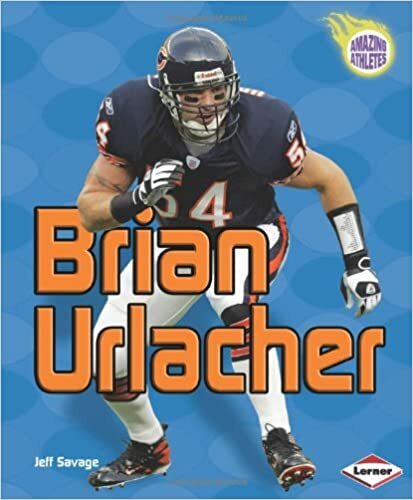 This is a very nice introductory book not only about Brian Urlacher, but also about the game of football. The opening chapter is action oriented and leads the reader through an actual game. Football terminology is introduced and words such as punt, kickoff and running back are highlighted in purple and are included in the glossary. This is an enthusiastic portrait of a man who "hustles when he is supposed to," works hard and is a role model to young and old alike. In the back of the book are "Selected Career Highlights," an index, a glossary and additional recommended book and website resources. Are you one of those people who wears a #54 football jersey? Goooooooo, BEARS! Quill says: Young football fans will enjoy this engaging read.